A couple weeks back, in a post where I noted that I passed my Cicerone Program Certified Beer Server test (16 July 2014; my profile page), I committed to writing a series of posts on the Cicerone Certification Program. I did write the #RoadtoCicerone Twitter chat post. This series should be 3-4 posts long: this one for intro and 1st level, another for Certified Cicerone, and one or two more for the 3rd level and alternatives/other certification programs. I may have more posts at some point about studying for the exams. This post will cover the following, along with covering the Cicerone Program Certified Beer Server (Level I). What the program does: certification, education, assessment. There are currently 7 Master Cicerones, 1544 Certified Cicerones and about 40,095 Certified Beer Servers listed in the roster. Every level requires access to beer in many different styles, with the number of styles to be known increasing with each level. It is possible that you may already have a lot of this knowledge but unlikely you have it all at immediate recall. Technically, you don’t need to drink any beer for the Certified Beer Server level—as there is no tasting component on the exam (all online)—but it helps. There will be plenty of questions that, while requiring factual (and a little theoretical) knowledge, are answered best from experiential knowledge. Well, truly best would be experiential (tasting) knowledge strengthened by simultaneously studying and evaluating using the Cicerone Certification Program framework for beer styles. This is quite possibly the lengthiest part of studying, at least for the Certified Beer Server exam. The Cicerone Certification Program uses the same schema/format/classification for all levels of certification. They use the (BJCP style guidelines) for ABV and SRM number ranges for each style, and they use their own word-based scales for Color, Perceived Bitterness and ABV. You best learn both ways of referring to bitterness and color. Every level has its own syllabus, which is freely available, which you will also need. More resources are needed as you go up in levels. Of course, this also depends on how much prior knowledge/experience you have with the covered topics. There are also optional study materials/opportunities available from the Cicerone Certification Program that you can shell out for. It makes sense in some cases. I discuss it a bit below. These are considered to be professional certifications and are priced accordingly. Cicerone.org is on record as stating that generally an employer is contributing something towards certification for their employee. Perhaps. Except when not. I discussed this a bit more with Cicerone.org via Twitter which you can see and read more of my comments at my Twitter Road to Cicerone #beerchat post. Next I will cover the first level, which is the one I am certified at. Syllabus (pdf) can be found here. This is only the outline. The full syllabus continues for nine more pages. “First-level certification exam for those who work with beer.” (CBS page) Since the Certified Cicerone is for “mature beer professionals” according to the founder, Ray Daniels, then I assume the Certified Beer Server is for not-yet mature beer professionals. Daniels asks “Can you think of anyone who should have a better knowledge of beer and its service than a beer writer?” and reminds us he started as a beer writer [See #RtC chat post]. Exam alone: $69 USA, $79 International. Based on how much you already know about beer, styles and brewing, etc. it should only take a couple months of studying to be ready for the Certified Beer Server exam. Notice that the optional BeerSavvy online training gives you access for 90-days so they seem to think that’s about the right amount. Beer – this is needed at every level, unless you are already an expert on styles and your knowledge can be expressed in the schema they use to describe them (a combination of their own and BJCP). Randy Mosher (2009). Tasting beer. Storey Pub. [ My review ] – This book is pretty much mandatory. If not the primary reference source (the syllabus, probably) then it is the next most valuable. Read this book. A couple of times. I have. And will again. Cicerone Certification Program Beer Styles Profiles Card Sets. I have a set of these and they are great. They do contain every style on the Certified Beer Server exam. although there may be some slight confusion: Imperial stout is listed in the American styles – Modern section of the CBS syllabus, while the card is Russian Imperial Stout and is in the British styles section. For the Certified Cicerone exam Imperial Stout is listed under both British – English – Dark Ales and American – Modern, but I am not sure whether they are considered equivalent for the exam. I’ll have more to say about these in the next post regarding the Certified Cicerone exam. Some additional educational resources recommended by the Cicerone Certification Program. There are plenty of other potential resources also. Some a little less pricey. I have no comment on the BeerSavvy online learning as I did not use it. If you are pressed for time and have limited capacity (for whatever reason) to compile your own study resources and guide your own studying then it may make good sense. There are possibly a few other cases where it makes sense. You are effectively spending $130 for training. I have no idea how long it takes to go through it once but it is probably faster than doing a lot of studying on your own. Who do I think it is for? This seems to me a very relevant question. I may (or may not) fit the standard idea of who should take the Certified Beer Server exam. I think I fit just fine, though. The larger question will be am I “in the mold” for the Certified Cicerone exam? Perhaps not. Yet. Maybe never. Pretty much everybody in the beer industry, from all aspects of a brewery’s operations, to distributors, on to the retail service end, ought have the knowledge required of a Cicerone Program Certified Beer Server. Many of those do not actually need to be certified though. I see certification—at some level and from some organization—becoming more important. It will mean more in much larger cities, particularly with trendy bars and dining experiences more readily available. It will also become increasingly important in real craft beer towns like ours, Bend, OR, and others. People who know (and appreciate) beer will want those serving them, slinging it around (distribution of whatever kind), and those producing the beer to also be reasonably educated regarding beer. It is hard to say how much certification will matter in the future as there are too many unknowns and too many different beer scenes. I do think demand will greatly increase though. Another source of folks to pursue these qualifications, even if they are “professional” certifications, are assorted hobbyists like me. Whether homebrewer, blogger, beer geek who wants to know more, or some other person, there are plenty of folks who are willing to learn and to pay for these professional certifications. This diverse group is clearly not any of these organizations primary market but they underestimate them to their own detriment. If industry is going to begin requiring that servers and others become professionally certified then there must be a pay off for the industry. The easiest way that I see to drive that is to get consumers to care whether or not those responsible for providing and/or serving them beer are certified are or not. If it makes no matter, who will pay for training/certification, and why? I think encouraging folks, like me (and not like me)—hobbyists, if you must—would help spread the word about the value of this sort of certification for the general consumer. I am most definitely a very-well educated, and certified, consumer of beer. There. I said it. But there is always more to learn. This post provided a general intro to the Cicerone Certification Program and covered the 1st level, the Certified Beer Server. This is the level at which I am certified and the only one I am qualified to answer questions about the experience of studying and testing. But I can still provide answers to many questions on the next two levels and indicate where to get more. Next up will be a post on the Certified Cicerone. Tuesday 15 July, Ray Daniels [see note below if you aren’t familiar with Daniels], held a Twitter #beerchat #RoadtoCicerone. During it he announced their new study program Road to Cicerone®, which was released the next morning. There will be 7 courses available in the Road to Cicerone® Self-paced Instruction for Certified Cicerone® Candidates but for now only the first is available: German Course. I am immensely interested in the German Course and what you get for $99 as I am currently setting up a beer styles study group for a small band of friends. While $99 is kind of pricey so is my time identifying and sourcing beers, researching history of the styles, and so on. Daniels also took questions regarding studying and other forms of preparation for the Certified Cicerone exam. Douglas Smiley asks about bloggers but I did not, nor could, find a reply. @julypena Yes. Four of the seven #RoadtoCicerone courses will focus on beer styles. It sounds like they are trying to make Cicerone.org more of a community, with multiple ways to support each other and, of course, pay for more education. Sounds promising to me. All forms of support are needed in serious studying. This is serious. Notice the best and worst pairings comment. Why do some pairings not work? Someone questioned the “new to beer” comment and Daniels clarified that he truly meant new. I’m not sure why someone that “new” to beer would be jumping into taking the Certified Cicerone but it is possible. Road to Cicerone courses: As I said above, the Road to Cicerone courses were announced during the Twitter chat. Exam Cost – Initial test: $345; Retake Tasting: $75; Retake Written: $150. **Please Note: Effective 9/1/14, the Certified Cicerone exam will be priced at $395. Retake Written $175, and Retake Tasting $100. I fully understand the cost of professional certifications and have paid for acquiring them, along with having paid dues to professional organizations for decades. I also know no one has to use the Road to Cicerone courses. But if they did? That is 7 x $99 (at pricing for 1st; last not due to 4th qtr 2015) + $395. Or, $1088.00. But you also need the Oxford Companion to Beer. Let’s say a round $1100. You still have to supply all of the beer. Do not mistake me. I am not judging. This will be great for many people. Some of the rest of us have the time, knowledge and inclination to do a lot of the research on our own. As I said above, I am immensely interested in what is in the German Course as I am currently designing a beer styles study group using the Certified Beer Server and Certified Cicerone syllabuses, the BJCP style guidelines, the Oxford Companion to Beer, etc. And, lo and behold, German’s are first. Very interested and will probably spring for it as soon as I can afford it. I also maintain that the Certified Cicerone certification is highly relevant to beer writers, possibly some bloggers, also to serious beer enthusiasts, and to many in the “beer industry” but certainly not all. Besides myself, I know of several people who are serious beer geeks but are not currently working in “the industry.” Some of us have assorted aspirations along those lines and some don’t. The point is we are highly interested in this certification. Synopsis: This is an excellent introduction to beer, beer culture and history, and the tasting (not simply drinking) of beer. Highly recommended! Mosher infectiously demonstrates his knowledge and passion without once talking down to the reader. He covers the history of beer, tasting, and analyzing all of your sensory responses to beer, the proper serving of beer to include glassware and temperature, beer and food pairings, and the different styles—in a less technical, more narrative way than the BJCP guidelines—and their history, among a few others topics. In the following more detailed commentary on the book I do not hold back on various quibbles I have with it. I intend to be forthright about what I conceive to be issues with any book I review while it is often harder to enumerate all of a book’s good qualities. Believe me when I say that this book as a whole stands head and shoulders above my complaints. They really are minor when the book is taken as a whole. The book is well-designed as Mosher is also a designer. It features nice typography and great photographs and illustrations which clearly convey the knowledge they are intended to. The book is full of information, well-written and designed, and extremely affordable. It is a must-have for any beer lover! “Tasting Beer tackles the experience of choosing and imbibing beer with just enough technical and scientific information to explain the events but not so much that the beer novice feels overwhelmed. Randy doesn’t preach his personal preference here. He celebrates the fact that our individual palates are as unique as snowflakes. … I am hopeful that Tasting Beer will find a home with professionals in addition to beer enthusiasts. I can think of no better single tool for brewers, bartenders, connoisseurs, chefs, salespeople, and everyone else in the beer trade for enhancing their beer IQ” (vii, Sam Calagione, owner of Dogfish Head). “Don’t even consider starting this book without a beer in your hand” (viii). “That isn’t to say that learning to understand and appreciate beer is hard. It is among the most enjoyable things you can do. But to get the most out of beer you have to put a little effort into it. 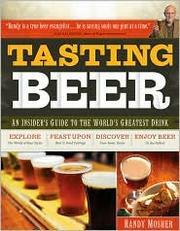 This book lays out the experience of beer in all its glory, in a logical and systematic way. Beer may be humble, but it is not simple” (1). “In Tasting Beer it is my hope to help guide you to a better understanding of the many things that make beer and our relationship with it so magical. With effort and information, you can gain the power to peer knowingly into its amber depths, approach it with keener senses, and find within in the meaning of beer” (4). Provides a sort of introduction to the book, with the sections: The Depth and Breadth of Beer, The Community of Beer, and Beer Today. “Beer is the great family of starch-based alcoholic beverages produced without distillation” (5). One minor quibble here. He miscites Michael Jackson’s groundbreaking The World Guide to Beer (1977) as World Beer Guide (25). I do have a 1st ed. of this book which I got for my birthday in early 1978. Provides a history of beer and overview of the market today with sections entitled: A Little History of Beer, Hopped Beer, The Rise of Porter, Cold-Fermented Lager, Belgium and France, North America, Europe in the Modern Era, America 1970 to the Present, and The Beer Marketplace, and sidebars on Technological Changes in Brewing 1700-1900, and England’s CAMRA Movement. … These conscious thoughts are deeply affected by social, cultural, and highly personal histories, and of course are always changing. They are also influenced by how much we can focus on the experience” (29). This chapter covers The Sense of Taste, Aroma and Olfaction, Psychological Factors, Mouthfeel, and the Visual; and includes sidebars on The Basic Flavors and Sensory Enhancement Practices. If your view of the process of taste is based on the old tongue map then it is based on outmoded science. The Sense of Taste section is short and to the point and paves the way for the following sections to complement and complicate it. The olfactory system is highly complex and is an area of rapidly evolving and hotly disputed science. “No less than five separate mechanisms have been proposed to explain the functioning of the olfactory system, and the real explanation may turn out to involve multiple mechanisms. It’s a fascinating area with a lot of research yet to be done” (32). “And lastly, compared to sight and sound, for example aroma and taste sensations take longer to register and linger longer. This is another reason to look at taste as having a time dimension—a beginning, middle, and end—rather than being just a single snapshot moment” (33). Interestingly, even the time of day affects our sensitivity (34). The important phenomena of “matrix effects,” “masking,” and “potentiation” are discussed (34-5). I feel that mouthfeel got short shrift here. I really wish he had said a bit more and there isn’t much else about it later in the book either. Now, this applies to everything else I have read about mouthfeel also. It’s like everyone sort of dances around it because no one is exactly sure what it is or at least how to put it into words. I think my feeling in this case is because he does such a great job everywhere else and his explanation is much shorter than some other sources I’ve seen. This chapter does what its title purports; it describes the brewing process, in some detail, and provides a fair bit of beer vocabulary, particularly around sensory concepts. It contains sections on Water, The Magic of Barley, Making Malt, Malt Types, Adjunct Grains, The Art of the Recipe, Mashing and Runoff, Hops, A Rolling Boil, Yeast and the Magic of Fermentation, and Packaging and Beyond. Illustrations, callouts and sidebars cover Deconstructing a Beer, The Flavor Wheel, Two- vs. Six-Row Barley, Malt Type and Beer Color, Ingredient Tasting, Sense and Nonsense in Beer Advertising Claims,Terroir in Beer, Cleaning and Sanitizing, and quite a few Sensory Vocabulary terms. On page 38 there is an excellent full-page, color reproduction of The Flavor Wheel. This book is well-designed from a graphic design perspective. Its many illustrations, photos, charts, maps, etc. are nice looking, informative, and clearly understood, and there is a nice use of color. But. This chapter is slightly less so due to the “seemingly” random strewing around of the Sensory Vocabulary breakout boxes. There seems to be little rhyme or reason as to exactly where they are and they break up a lot of text, although they are generally placed near (or in) a relevant section; such as, Mineral sits in the middle of Water and Metallic is near the end of water where metals are mentioned. If you try to keep up with them as they appear then your reading of the main text will be highly disjointed. I am not sure what drove the decision on their placement but it should be rethought for a second edition. I also have the Kindle version of this book, which I can use on my iPhone, iPad or Mac—we do have a Kindle but it is attached to my wife’s account and I bought this book. It has the same issue of breaking up the text, although the placement of the breakout boxes are slightly different. Ingredient Tasting (46) – excellent suggestions for familiarizing oneself with the flavors of brewing ingredients. IBUs – “the parts per million (ppm or mg/L) of iso-alpha acids in the finished beer” (71). “As for hop bitterness, once in the beer it’s all pretty much the same. Hops express their considerable individuality through their aromas” (72). Discusses sources of haze, whether unintentional or intentional. This chapter discuss the qualities of beer and their associated measurements. Sections include: Gravity; Alcohol and Attenuation; Beer Color; Hops, Bitterness, and Balance; Haze and Beer Clarity; Evaluating Clarity; and Carbonation and Beer Foam. Illustrations, callouts and sidebars cover: Drinkability: What Is It?, Alcohol Strength by Beer Style, Beer Color Scale, Beer Color and Beer Styles I and II, Bitterness by Beer Style, Relative Bitterness, Filtration: Dream or Nightmare?, Pouring for Great Foam, Selected Beer Styles and Carbonation Levels, Pressure and Temperature as Related to CO2 Volumes, and Carbonation: Natural versus Artificial. This chapter is about tasting beers and all the various hows from casual to serious beer judging; sections include: The Tasting Environment, Tasting Types, Judging and Competitions, Non-competitive Evaluation and Taste Panels, Presenting Beer for Judging or Evaluating, How to Taste, A Sampling of Tasting Events, and Making the Most of Beer Festivals. The illustrations, callouts and sidebars are: a tasting record, Tasting Types and Their Requirements, ISO Standard Tasting Glass and Plastic Judging Cup, Common Spiking Chemicals, How Do You Become a Beer Judge?, and Suggestions for Tasting Types. Sections include: Temperature, Bottles and Draft, Cask [Real] Ale, The Beer Glass, Proprietary Glassware, and Storing and Aging Beer. Illustrations, callouts and sidebars include: Checklist for a Well-Served Beer, Suggested Serving Temperature, Forms of Bottled Beer, Keg Theft, Send It Back!, Warm and Flat?, Historical Beer-Drinking Vessels, Modern Classic Glassware, A Proper Weissbier Pour, Aging Time for Various Beer Types, and Notes on Selected Vintages of Thomas Hardy’s Ale Fall 1997. Sections include: Getting Started, Staging a Beer Dinner, and Cooking with Beer. Illustrations, callouts and sidebars include: Foods in Order of Increasing Importance, Food and Beer Interactions, Beer and Food Commonalities, Familiarity-Based Pairings, Beers for Light Appetizers and Beers for Hearty Appetizers, Beer and Cheese Pairing Suggestions, No-Brainer No-Fail Beer and Cheese Pairings, Pairings from a Recent Chicago Beer Society’s Brewpub Shootout, and Dishes Prepared with Beer. Sections include: a long intro (most are short); Technology and Beer Styles; Laws, Taxes, and Beer Styles; and Pressures of the Beer Business. The illustrations, callouts and sidebars are: The Grape Line (in Europe), The Year in Beer, A Few Notes on the Following Styles and Suggested Beers. This chapter serves as the preface to the next five chapters on beer styles. NB: (Almost) all styles throughout the book have the following information included in them: short paragraph giving history, where they fit in with other styles and similar information; following this they include location, flavor, aroma, balance, seasonality, pair with (foods for pairing), and a list of suggested beers to try. They then have a pale yellowish colored breakout box listing the gravity, alcohol, attenuation/body, color, and bitterness. “Porter has changed every generation during its nearly three-century history” (161). Sections include: Beer in the Dark Ages; Toward the Modern Era; An Exporting Nation; The Roots of Modern Styles; Real Ale, Rescued; The Taste of Ale; Pale Ale and Bitter (Classic Bitter, Classic English Pale Ale, India Pale Ale); Burton Ale [Historical style]; Scottish Ales (Scottish Light Ale, Scottish Heavy, Scottish Export, Scotch Ale/Wee Heavy) ; and English Brown Ale (Northern English Brown Ale, Mild Ale, English Old/Strong Ale, English Barley Wine, Porter, Baltic Porter, Stout, Irish Dry Stout, Sweet [London] Stout/Milk Stout, Oatmeal Stout, Irish Foreign/Extra Stout, Imperial Stout). There are only a few illustrations and sidebars in this chapter other than pictures of beer bottles, and the random quotes which are spread throughout the book. Local note: Deschutes Pilsner listed as in “American Craft Examples of Classic Lager Styles” (168). Sections include: The Flavor of Lager Beer; Bohemian Pilsner; German Pilsner; Münchener Helles; Dortmunder Export; American Pre-Prohibition Pilsner; American Adjunct Lage; American Light Lager; American Malt Liquor; Oktoberfest, Märzen & Vienna; Munich Dunkel; American Dark/Bock [Historical Style]; German Schwarzbier; German Porter [Historical Style]; Maibock/Heller Bock; Dark [Dunkel] Bock; Doppelbock; Rauchbier; and Steinbier [Historical Style]. Again, there are only a few illustrations of note and callouts in this chapter: American Craft Examples of Classic Lager Styles, Pale Lagers Around the World, Kellerbier, and Some American “Heritage” Breweries and Their Old-School Brands. Sections include: Kölsch, Düsseldorfer Altbier, American Cream Ale, Steam Beer, Sparkling Ale [Historical Style], Weissbier/Hefeweizen, Bavarian Dunkel Weizen, Weizenbock and Weizen Doppelbock, Berliner Weisse, Broyhan Alt [Historical Style], Grätzer/Grodzisk [Historical Style], Gose [Historical Style], and Lichtenhainer [Historical Style]. Callouts, again few, are: What’s in a Name?, and To Lemon or Not to Lemon? Sections include: 5,000 Years of Belgian Beer, The Uniqueness of Belgian Beer, Belgian Pale Ale, Belgian Strong Golden Ale, Belgian Strong Dark Ale, Abbey and Trappist Ales (Belgian Abbey Dubbel, Belgian Abbey Tripel), Saison, Witbier/White Ale, Lambic, Sour Brown/Oud Bruin, and French Bières de Garde. The illustrations, callouts and sidebars are: Belgium’s Overlords 1477-1830, Belgian Beer According to G. Lacambre 1851, Classic Trappist Breweries and Their Ales, Turbid Mashing and Slijm, Lambics to Try, and A Few Belgian Eccentrics. “basically a beefy session beer, so good drinkability is important. The key to this is using hops in a way that is assertive without being tiring; building a malt base that is profound but not cloying. The emphasis should be on bitterness rather than aroma, although some aroma is a good thing. …, malt aroma should have the upper hand” (214). Sections include: Brewing with Purpose; Born in the Boneyard; An American Sense of Style; A Tempting Future; The Big, Bold Taste of Craft Beer (American Pale Ale, American IPA, Double/Imperial IPA, Amber & Red Ale, American Barley Wine, American Brown Ale, Porter and Stout, American Wheat Ale, Fruit Wheat Beer, and Pumpkin Ale); Up and Coming (Historical Re-Creations and Fantasies, Single-Hop Ales, Wet-Hopped Ale, New Belgian-American Ales, Barrel-Aged Beers, and Hyper-Beers). The few sidebars are: What Is Craft Beer?, Craft Beer Around the World, Other Imperialized Beers, and Some Newer American Hop Varieties. Beer on the Page is, of course, of immense interest to me as a librarian and book nerd. If you are interested in books on beer and brewing, especially those of a historical nature, then see this section for its recommendations. Sections include: The Joys of Beer Clubs, Brew It Yourself, Breweriana, Beer on the Page, Beernog (and Other Concoctions)!, and A Final Word. As I said above, this is an excellent introduction to beer, beer culture and history and the tasting (not simply drinking) of beer. Highly recommended! Mosher, Randy. Tasting beer : an insider’s guide to the world’s greatest drink. North Adams, MA: Storey Pub., 2009. Print. Lorna Juett, in the Chicagoist, wrote a post entitled Beer Nerd Rant: How To Appropriately Use a Beer App in response to a c|net video review of beer apps. The post is clearly from the perspective of a server and/or bartender and, despite my being neither, I can’t agree more! The video [which is also embedded in the post] and the response discuss Untappd, Beer Buddy, and the BJCP Styles (Beer Judge Certification Program). I am a user of Untappd and I have the BJCP Styles on my devices but I almost never consult it when out and about. There are vastly different philosophies on whether it is appropriate to consult the beer judging style guidelines when tasting beer outside of formal judging events. I also just downloaded the Beer Buddy app [it is currently $0.99 and not $3.99 as mentioned in the video] but have yet to use it. As a user of Untappd I don’t check in every beer I have although I do try to check in all of my unique beers; that is, beers I have for the first time. Sometimes though it is hard to get even all unique beers entered. This brings me to my reason for responding to the post by Juett. First, I fully agree that mooching multiple tastes from your server is crass behavior; at best. And while Juett does write “upwards of 15 beers a night,” I did want to add that there are perfectly acceptable reasons for adding what might seem like an excessive number of beers in a sitting. Many bars and brewpubs offer flights of beers. Usually these are 4-5, sometimes up to 8-10, 3-5 oz. pours of different beers available on tap. My wife and I frequently get flights on at least two sorts of occasions: there are simply too many good sounding things to choose from at the moment at a bar, or on visiting a brewpub for the first time so we can get a good overview of a brewer’s (current) output. While I agree that there is something to be said for drinking a whole glass of beer and, as Juett writes, “seeing how their aromas and flavors change as they warm up, and the way your general impression changes about a beverage once you’re halfway into it,” I also don’t believe that it is the only valid way to experience beer. Admittedly, most of my beer drinking is exactly like that and I wouldn’t have it any other way! But that in no way implies it is the only way. Now, it’s not likely I will check all of them in. To qualify for the assorted badges, Untappd enforces a 10 minute limit between check ins. I make my tasting notes in my paper notebook first anyway and then when I have a couple entered there I enter the first in Untappd. Once I make the first check in I set the timer on my phone for 10 minutes and go on with my tasting, and enjoying, as that is the point. When the alarm goes off I enter the second beer, and so on. Seeing as how social many of these events are adds another problem dimension to trying to check in large numbers of beers. Sometimes check in has to wait until I get home. But seeing as I want them entered as close as possible to when they were consumed the next day is off limits for me [and for the spirit of the app]. Thus, even at perfect 10 minute entries it would take a span of over 2.5 hours to enter 15 beers if one wants every one of them to count for badges in Untappd. That is a long time, whether at the bar or at home afterwords. Bottom line, when someone, especially a server, is talking to you, PUT DOWN THE DAMN PHONE. On that note I fully agree with Juett. And bumming lots of free tastes from a server is also off limits, whether or not it is for entering in some tracking mechanisms as having had that beer. That is unethical! Let me clarify, the entering is only adding insult to the unethical behavior. Free samples are only for the purpose of deciding which beer you want to actually order (and pay for). There are, though, perfectly valid reasons for entering numerous beers into Untappd or some other tracking system in a sitting. There may well be others I haven’t touched on; in fact, I have no doubt there are. Perhaps Juett would agree as nothing explicitly otherwise was written in the article. My concern was that it made it seem like any reason for checking in many beers in a sitting was equivalently egregious. Maybe I just read into what was said without meaning to. I do like a bit of nuance though.